3 PACK BOXES OF 6 oysters LES PERLES DE VALENCIA. Oysters with a fine and delicate nutty flavor, characterized by its very aromatic vegetable aftertaste. It has a high rate of meat and the typical color of the Valencia waters. To seduce the most demanding palates. 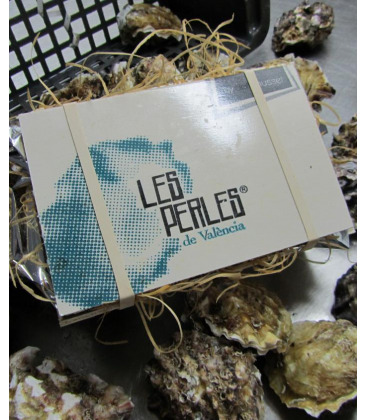 3 PACK BOXES OF 6 oysters LES PERLES DE VALENCIA. Valencia’s cuisine has an essential protagonist: “Les Perles de València”. Taking the best seeds and using the most appropriated growing method, we get these Valencian unique oysters, a very special and exclusive oysters. Its principal organoleptic properties, as a result of growing in the Valencian waters, is its soft and delicate nutty flavor and its peculiar color, given the phytoplankton of, its aliment in the valencia waters. Besides, our oysters are characterized by its vegetal and aromatic aftertaste and its high rate of meat. Without any doubt, this oysters -“Les Perles de València”- will seduce the most demanding palate.